I found out how to set your DISH DVR Hopper system update time, you know, that time when your Dish TV system reboots itself. It's about time! I can't tell you how often I've been watching TV and when 1 AM rolls around, no matter what I'm doing, the system does a reboot during it's daily update check. Gads, I hate that. 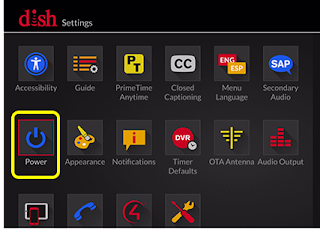 Regardless of whether you're watching a DVR recording, live TV or what have you, bam, that menu pop up comes on your screen. Every now and then you have the option to delay the update, but I'd guess at least half the time, the system is going to do what its going to do. I think I may not be looking when the option comes up to delay it... I think. Grr. Or... I hated that. But thankfully, (after how many years? ), Dish has provided a way to at least set what time your DVR system is going to look for or update itself. ---POWER ON - choose an option on what the system will show you when you turn the TV on. ---DAILY RESET - Here you can set what time of day the system will do its thing. Boom... there you have it. Source - Dish TV Support. How To Make A FLICKR Album Private!